Mr. U and I have been married for 19 years. And over the course of these wonderful 19 years, I've probably made at least 12 different pizza dough recipes. I have been searching for THE recipe- you know, the one that makes you want to make homemade more than you want to call up Domino's or Little Caesar's. Y'all... I FINALLY FOUND IT!!!! I said last year I'd share the recipe after we made it several times and we were all positive it was "the one". Well, IT IS!!!! So I'm finally sharing it, It's so good and really easy- so easy that my 11 year old is now the official pizza crust maker. So STOP TALKING and get to the recipe, right?? This can also be made ahead and frozen!!! Knead the dough and instead of letting it rise, place it in a zip loc freezer bag and close it tightly. When you are going to use it, take out of the freezer and out of the bag and place in a lightly oiled bowl. Let it thaw and then rise- anywhere between 4-6 hours based on how cool or warm your kitchen is. When risen, roll out and bake as directed above. We've also made this in the morning when we knew we were going to be gone all day!! When you put it in the lightly oiled bowl, cover loosely with plastic wrap and put in the fridge. When you get home and ready to cook dinner, take it out and see how it's doubled!! It's all ready to be rolled out into a pizza shape for dinner and baked like the recipe says!! Y'all, it's SO SO SO good to finally have "the one" after all these years of my attempts!! So excited to try "the one"! Thanks for sharing and Pinned! It sure looks yummy! Pinned. It looks delicious, thank you! 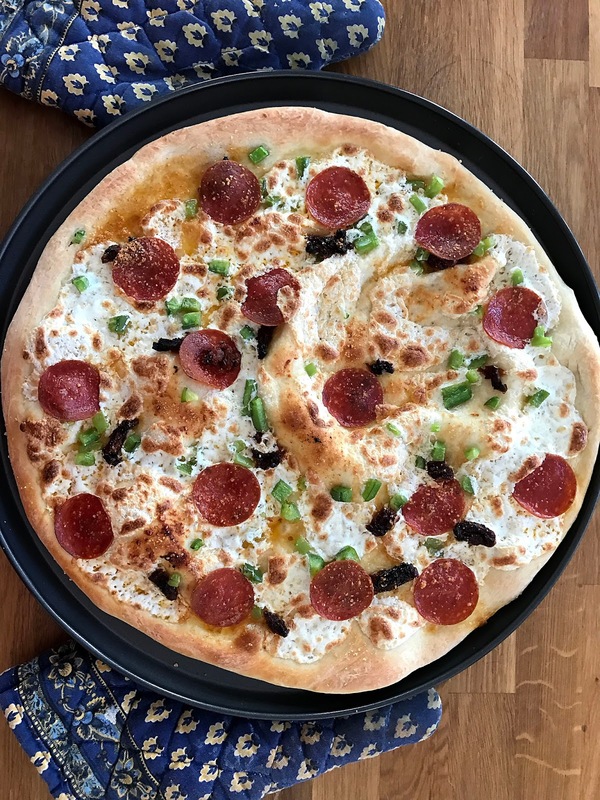 The finished pizza looks delicious and you make it sound so easy to make the dough! I’d love for you to share over at Let’s Party! https://themarkandjanshow.com/2018/02/13/lets-party-8/ … we look forward to seeing you there! I make pizza with store bought as I haven't found the best dough yet...going to try for sure! Looks delicious. 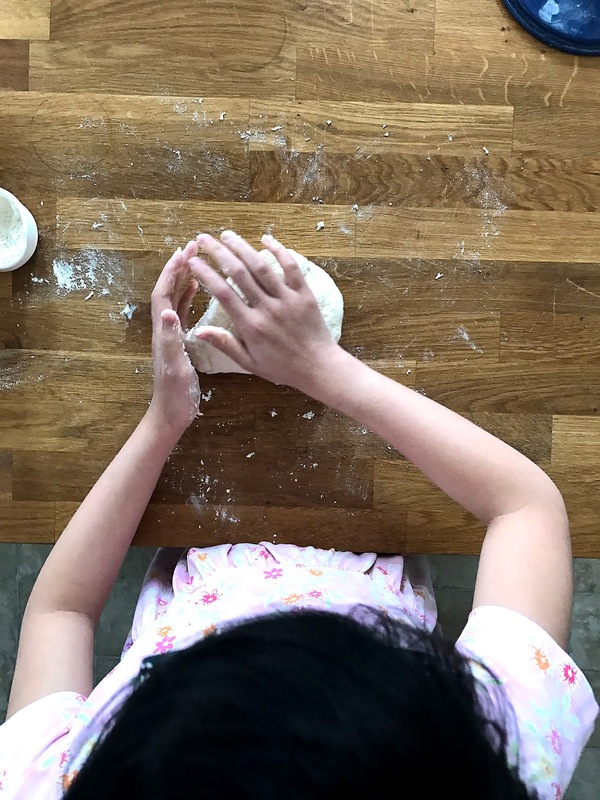 We love homemade pizza :) Thanks so much for sharing your post with us at Welcome To The Weekend Blog Hop. Have a great week and we hope to see you soon! I am really looking forward to trying this recipe out. I haven't tried it but your crust looks really light which is how I like it. Funny enough I just bough fresh pizza dough from the grocery store today and now wish I hadn't. Next time I will try this out for sure. I am currently obsessing over sourdough pizza dough - it's SO tasty! I love your recipes and I'm always glad to see them on the Friday Frenzy! I love the idea of using bread flour! Thanks for sharing! I'm excited to try this recipe, but I'm wondering if you have ever used just regular flour. Thanks so much for sharing your recipe. "The one" definitely looked like the perfect pizza crust in the photo! Much better than the Dominoes, Pizza Hut or any of those other versions. Thank you for sharing it with us at #PartyinYourPJs! Your Pizza Dough looks great, I will be trying this recipe! Thanks so much for sharing your awesome post with us at Full Plate Thursday. Have a great week and come back soon! Ok, this sounds like a great recipe. I finally had resigned myself to buying the dough at the store, so now I'm inspired to try your recipe! Thanks so much for sharing! Also, thank you for joining our Friday Friends Parade Linky Party! I've already shared it with my daughter who is in the kitchen all day and now I am going to feature it on Sweet Inspiration this Friday. Congrats on a great recipe.